Continuing our review of some of the heraldry in Mount Stuart, we came across this armorial gem. This is most likely, based on a review of the lives and times of the few Williams, Earls of Pembroke/Penbroke, "William Herbert, 1st Earl of Pembroke, K.G. Master of the Horse 1548-52, President of the Royal Council in Wales 1550-3 and 1555-8, and Captain General of the English Army in France 1557, who was installed a knight of the Garter in 1549, and elevated to the peerage as Baron Herbert of Cardiff, co. Glamorgan, 10 Oct. 1551, and on the morrow, created Earl of Pembroke. ... He d. 17 March, 1569-70, and was buried in the cathedral of St. Paul's on the 18th April following." The arms, placed within the Garter (note the painting also shows him wearing the collar of the Order of the Garter), have Herbert (Per pale azure and gules three lions rampant argent, seen in other locations in Mount Stuart; for example, in the stained glass window below) in the first quarter differenced by a bordure compony. And in fess point there is a crescent or for difference, the cadency mark of a second son. These differences - the bordure and the crescent - stem from the time the Earldom came back into the Herbert family, following it's being held by Edward Plantagenet, son and heir of King Edward IV, and then by Anne Bullen (or Boleyn), created Marchioness of Penbroke by King Henry VIII in 1532. This coat of arms came into the Stuart (and later, Crichton-Stuart) family from the marriage of John Stuart, Viscount Montstuart, and Charlotte Jane Hickman-Windsor, daughter of Herbert Windsor, 2nd Viscount Windsor, and Alice Clavering. As heir to her father's estates, Charlotte brought some very large estates, especially in south Wales, with her into the marriage. John Stuart, Viscount Mount Stuart, in 1776 was elevated to the peerage in his own right as Baron Cardiff of Cardiff Castle owing to his wife's lands in Wales. In 1792, he succeeded his late father as the 4th Earl of Bute, and in 1794 was created Viscount Mountjoy, Earl of Windsor (both titles held by his late father-in-law), and (1st) Marquess of Bute. As you can see from the detail of the portrait above, he bears the Windsor arms in pretense (in right of his wife), and has surmounted the shield with a the coronet of a baron (as the title of Viscount was a courtesy title from his father). And here, I believe, is a portrait of Charlotte Jane Hickman-Windsor, though the clothes she is wearing here are from a good 150 years (or more) before this time. Could it actually be a painting of one of her female ancestors? That is certainly possible, but I have found no likely candidates in the history of the Windsors. Were they painting portraits of 18th Century women wearing late 16th-early 17th Century clothing? I have no idea. In any event, these are but two of several armorial portraits hung in some of the rooms at Mount Stuart. We'll be looking at more in upcoming posts, so as they say on TV, "stay tuned!" Though not quite as involved as the heraldic family tree ceiling in our last post, one of the staircases in Mount Stuart has some very impressive stained glass windows which describe some of the marriages within the family over the years. Most noticeable are the arms of the Stuarts (Or a fess checky azure and argent within a double tressure flory counter-flory gules) and the Herberts (Per pale azure and gules three lions rampant argent), but you'll see a number of other families represented here as well. Notice how they have continued the literal family "tree" motif here. It's a remarkably impressive display of heraldry and family alliances. But let me tell you, at Mount Stuart there is an armorial family tree that so pales all the others by comparison, that I want to steal (and modify) a line from the movie Crocodile Dundee: "That's not an armorial family tree; this is an armorial family tree!" Covering the entire ceiling of one of the ground floor rooms at Mount Stuart is an armorial family tree that puts all the others to shame. I'm just going to leave these here for you. I'm sure that I could probably pull out my Burke's Peerage and follow most of the lines of this family as they are displayed here, but looking at this ceiling, I frankly don't think that anything more needs to be said, except: "This is an armorial family tree!" And you thought your kegerator was a great addition to your house. To borrow a line from the movie Crocodile Dundee: "That isn't a keg. This is a keg." This is the Mount Stuart answer for when you have company over and someone mentions that they are feeling a bit parched. Naturally, is has the arms of the Crichton-Stuarts on it, in etched brass in the same general style as many of the stall plates you might see in, say, St. Giles in Edinburgh or St. George's Chapel at Windsor. The display of heraldry includes the arms (Quarterly Stuart and Crichton), with the coronet of a marquess replacing the torse, the demi-lion crest of the Stuarts issuant from the coronet, and a different version of the motto, Nobilis ira (Noble ardor), which my hardbound copy of Fairbairn's Crests cites as that of Creighton-Stuart (not that I think that the different spelling Crichton is any real difference), replacing the longer one we saw on the tapestries last time, Nobilis est ira leonis. Once again, then, we have a little something to consider the next time you are looking for something cool for your house that you can also mark with your coat of arms. Going inside Mount Stuart is a heraldry enthusiast's dream; you can hardly turn around without seeing a coat of arms done in one fashion or another. Say, for example, on a tapestry or two. These two tapestries (you can click on the pictures above to see them in greater detail) are labeled "The Time of the Meeting" and "The Lord of the Hunt" in English and in Gaelic. Each has, center top, the Stuart coat of arms (Or a fess checky azure and argent within a double tressure flory counter-flory gules) on an oval surmounted by the coronet of a marquess, supported by two winged cherubs who also carry, between them, the motto of the Crichton-Stuarts, Nobilis est ira leonis (The lion's anger is noble). Nicely framed between the pillars supporting the ceiling in the room, these two tapestries are a warming, softening, and impressive, display. Something to keep in mind the next time you're in the market for a little heraldic something to hang on the wall. 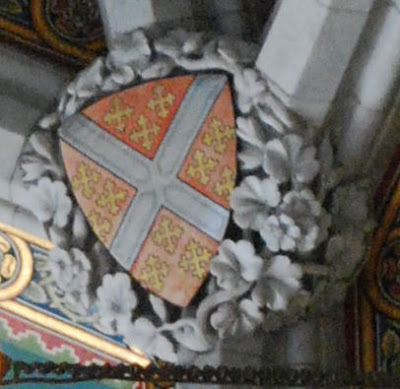 Okay, I have to admit, that despite all of the heraldry that can be seen at Mount Stuart (a lot of which I'll be sharing in upcoming posts), not every appropriate surface was covered with coats of arms or other heraldic designs. As you can see (click on the picture above to see a bigger version), on this faux balcony on the exterior there are eight perfectly good shields. There may be a perfectly good reason for these empty shields on the exterior of the building. That is not for me to say. I will say that I was certainly tempted to get a long ladder, a paintbrush, and several cans of paint in heraldic colors. The next stop on our heraldic tour of the Isle of Bute was Mount Stuart, the home of the Marquesses of Bute, a lovely place in which it is pretty much impossible to even turn around without seeing heraldry. Of course, when you are designing a home for yourself and you have an important lineage, you'll probably go ahead and include the family coats of arms and crests all over the place, if only to try to overawe your visitors. Mount Stuart was originally built in 1719 by the 2nd Earl of Bute, and rebuilt by the 3rd Marquess of Bute following a fire on December 3, 1877, which destroyed much of the house. Two Georgian wings survived, but the main house was completely redone in flamboyant Gothic Revival. But, of course, it is the heraldry which is the main attraction to me, and there was heraldry to be seen before even entering the doors, in the form of a deeply carved achievement of arms. If you look closely (you can also click on the image above to see a larger copy), you can also see the crossed key and tower on a staff behind the shield which we also saw on the display in the Bute Museum. Watch for more examples of the Stuart, Crichton, and Herbert arms and crests as we make our way through Mount Stuart in the next several posts here. It appears very much to me like a carved decoration from the stern of a large boat or small ship. It is beautifully carved -- just look at the way those thistles run from one end to the other, framing the achievement of arms in the center. That is not to say it is without its issues. It appears to have been overpainted, more than once, and some of the colors used are incorrect (as you will notice when comparing the picture below to the blazon). Plus, the escallops in the husband's arms look more like garbs. And the ermine tails on the husband's fess and the small charges on the label on the wife's arms are lacking. The torse appears to be carved as a solid, straight bar perched precariously atop the helm. It is the achievement of arms of Alexander William George Duff, 1st Duke of Fife, and his wife, H.R.H. Louise Victoria Alexandra Dagmar, the Princess Royal, eldest daughter of King Edward VII. His arms are: Quarterly: 1 and 4, Or a lion rampant gules (Fife); 2 and 3, Vert a fess dancetty ermine between a stag's head cabossed in chief and two escallops in base or (Duff). Her arms are the Royal Arms of Great Britain with an inescutcheon of Saxony and with a white label of five points charged alternately with three St. George's crosses and two thistles slipped and leaved proper. 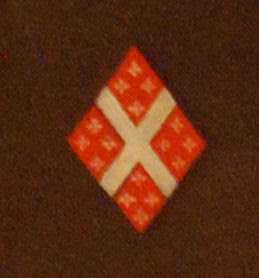 The crest is A knight on horseback armed cap-à-pie. The supporters are Two savages wreathed about the head and waist with laurel and holding in their exterior hands a branch of a tree over the shoulder all proper. I am unable to make out the motto above the crest. (If I have to guess, I think it begins with "Deo", but my picture (and the overpainting) is not clear enough to make out much more than that.) The motto under the the shield is Virtute et operâ (By virtue and deeds). Even with all of it's errors, though, it's an amazing display of heraldry, and a wonderful piece to run across in a little museum in Scotland.